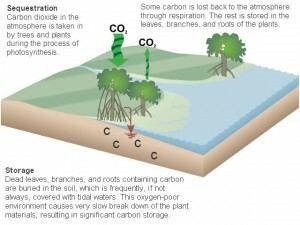 As carbon dioxide remains one of the most targeted and analyzed compounds contributing to both Earth’s natural and anthropogenic greenhouse effect and subsequent global warming, scientists and citizens alike turn to the abilities of natural features to engage in carbon sequestration to capture and store detrimental atmospheric carbon. 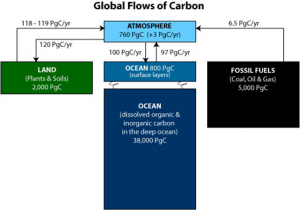 There are many approaches to deal with CO2 abundance issues such as: geoengineering practices, carbon capture from flue gases to be stored in underground reservoirs, and biogeochemical cycling that moves carbon between the atmosphere and natural land formation reservoirs. In acknowledging these feats of natural phenomenon coupled with scientific achievement, the concept of ‘blue carbon’ emerges as an increasingly salient mechanism that aids in the sequestration of atmospheric carbon into ocean ecosystems. 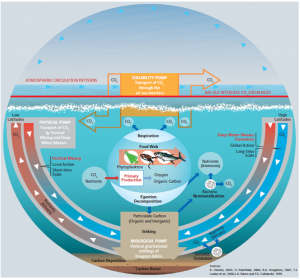 Although it is the common belief that the ocean has a nearly infinite ability to assist in removal of harmful CO2 particles emitted naturally and through anthropogenic activities, this is clearly not the case, as evidence resounds from the scientific community exemplifying the declining rates and ability of carbon sequestration by some of earth’s most critical vegetated coastal ecosystems, a direct result of habitat destruction. Although commonly accepted scientific data and corresponding figures attribute fossil fuel combustion as the largest source of anthropogenic greenhouse gases emitted to the atmosphere, another major contribution proceeds from acts of deforestation and land use conversion, estimated to be the source for 8-20% of international emission totals (van der Werf GR, 2009). This concept has recently been expounded upon, further attributing GHG emissions to the ‘use’ of vegetated coastal ecosystems, thus disturbing carbon deposited both in the underlying sediments as well as the various organic matter found in these networks. The carbon stocks residing in these storehouses or pools are entitled ‘blue carbon’, and while there are no exact data sets to produce a precise quantitative measure, current studies reveal better figures and enhance predictions, lending insight as to the detrimental effects of GHG leaching that results from the degradation and loss of these ecosystems. As is often the case in dealings of policy, politicians designate a certain extent of neglect or mistrust to relevant but newly released and comparatively under-reviewed data, and thus the protection of blue carbon systems has gone mostly unaddressed in the political realm. In terms of geographic situation, there are three main regions where carbon deposits can be found in high density among vegetated portions of coastal wetlands. Tidal (or salt) marshes can be found throughout all climactic regions, while sea grass beds range from polar waters to tropic regions, and mangroves appear only in the tropics and sub-tropics. These areas cover a total of about 49 million hectares, thus lending a range of services from recreational activities, such as fishing, to environmental protection through buffering nearby coastlines and absorbing carbon emissions and other atmospheric pollutants (Barbier EB, 2011). Because of habitat conversion and land-use of these ecosystems, anthropogenic accelerated changes over the last century have produced a 25-50% decline in total area of each type, internationally (McLeod E, 2011). In terms of the current annual scale, scientists have placed estimates of vegetated coastal ecosystem degradation at approximately 0.5-3% per year. To be more specific, pooling the resources presented and cited throughout this review provides that the current rates of global vegetated coastal ecosystem land loss is about 1-2% annually for tidal marshes, 0.4-2.6% for seagrasses, and 0.7-3% for mangroves (McLeod E, 2011). Although this number varies with the type of region as listed above, the decline translates to about 8000 square kilometers per annum. If projections for the next 100 years are made based upon these figures, the above statistics translate to a 30-40% decline in tidal marshes and seagrasses, and even more severe deterioration to mangroves, reaching up between 90 and 100% (Waycott M, 2009). In a modern era where a growing proportion of nations are installing and commissioning renewable energy sources to address problems posed by the presence of previously emitted greenhouse gases, understanding the necessity of blue carbon mechanisms and abating the degradation of their respective environments could prove pivotal to reducing the stressors brought on by global warming. Barbier EB, Hacker SD, Kennedy C, Koch EW, Stier AC, et al. (2011) The value of estuarine and coastal ecosystem services. Ecological Monographs 81:169–193. van der Werf GR, Morton DC, DeFries RS, Olivier JGJ, Kasibhatla PS, et al. (2009) CO2 emissions from forest loss. Nature Geoscience 2: 737–738. McLeod E, Chmura GL, Bouillon S, Salm R, Bjork M, et al. (2011) A blueprint for blue carbon: toward an improved understanding of the role of vegetated coastal habitats in sequestering CO2. Frontiers in Ecology and the Environment 9: 552–560. Waycott M, Duarte CM, Carruthers TJB, Orth RJ, Dennison WC, et al. (2009) Accelerating loss of seagrasses across the globe threatens coastal ecosystems. Proceedings of the National Academy of Science USA 106: 12377–12381.